The Windows Live team announced today that they’re rebranding their new email beta to Windows Live Hotmail. We haven’t written about the application for some time, and this is as good an excuse as any to compare the current release to Gmail and the new Yahoo mail beta. The three applications, along with AOL mail, make up the vast majority of the 500 million or so webmail users around the world (see chart included in this post). Most of these users are still using the old, tedious, Ajax-free Yahoo Mail and Hotmail user interfaces, requiring page refreshes for every click. The new applications, along with Gmail, offer a much richer experience, much like Outlook or Mac mail. When these webmail clients are performing well, their speed and ease of use is easily as good as a desktop client. Overall we prefer Gmail over all other webmail applications because performance (speed) is consistently fast, and emails can be tagged making search much more effective. They also offer more storage and other features, and it’s free. However, Yahoo and Live Hotmail offer more mainstream Outlook-like user interfaces (although Live Hotmail does not allow you to access other email accounts from their application), whereas Gmail takes some time to get used to. If you are looking for speed and tagging is important, Gmail is for you. If you are looking for the closest thing to Outlook online, go with Yahoo Mail. The following chart compares the services on a feature-by-feature basis. 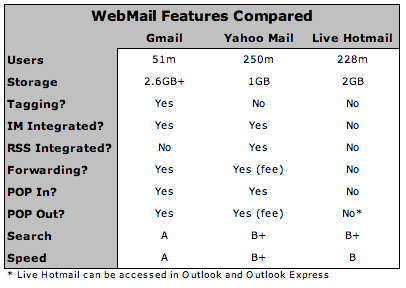 Note that the user numbers for Yahoo and Hotmail include legacy users still on the old platforms. Gmail groups emails in a thread into a single line in the inbox. Some users love this, others hate it. It’s not my favorite feature, but I’ve gotten used to it. The best Gmail feature in my opinion is the ability to tag emails for better organization and search. None of the other services offer this. Gmail also has integrated Gtalk into the GMail interface, and continues to add other functionality as well (such as integration with Docs & Spreadsheets). Gmail is consistently fast, offers the most storage and free POP-in and POP-out, meaning you can use Gmail to access your other email accounts, or access GMail from whatever email client you use. It’s a near-perfect piece of software, and has only occasional hiccups. The fact that Google is paired with Google Calendar, the best online Calendar application, doesn’t hurt, either. The new Windows Live Hotmail will be a welcome change to Microsoft’s 228 million webmail users, but it falls short of the Yahoo and Gmail offerings. They offer 2 GB of storage, better than Yahoo, but there are no POP-in or POP-out features at all. If you want to access your account outside of the web site, you have to do it via Outlook or Outlook Express. It remains the slowest among the three in our tests. Yahoo Mail is very good, allowing users to access other email accounts (POP-in), but only offering POP-out access for an additional fee. This is probably due to the legacy users who are already paying for this feature – Yahoo may not want to give up this revenue stream. Storage is on the low side – only 1 GB, which is less than half of what Gmail offers. Still, Yahoo Mail has recently been running very fast and offers an intuitive, Outlook-like interface. Instant Messaging and RSS integration is awesome.